In like a lion, out like a lamb! There are three weeks until the end of the quarter. Let’s work hard! We will continue our electrostatics unit. Homework 1 will be due on Monday, and homework 2 will be due on Tuesday. We will take quizzes over Coulomb’s law and electric fields, as announced. Also this week: One of my favorite labs EVER!!!! Also note: Unit 9 test corrections are due by Friday. We will spend Monday and Tuesday doing assignment 1, followed by a quiz, which will be announced. Next we will conduct an experiment on circular motion. (We will need safety goggles, so if you have your own, please feel free to bring them. However, I do have a disinfected class set, as well.) Toward the end of the week (when announced,) please take notes on Podcast 5 – Gravity and Podcast 6 – Center of Mass, Gravity, and Planetary Orbits. We will do assignment 2 by the end of the week or early next week. Expect the unit test next week. Our unit 1 test is Monday. To help you prepare for the test, please do the Unit 1 – Homework Questions for Monday. Our Unit 1 webpage has every lecture podcasted to help you review. Remember also that your Unit 1 – Outdoor Lab is due NEXT Tuesday, March 11, so look for a clear night when you have a couple of hours available to go outside to make repeated observations. Starting Tuesday we’ll turn our attention to a welcome friend, the sun! Unit 1 focused on the night sky, and unit 2 will help us understand the astronomy of the day sky. I hear this all the time (pun intended! ): Cracking knuckles causes arthritis. But does it? We will finish our unit on thermal physics. Homework 4 will be due on Tuesday, we will do practice FRQs in class on Tuesday, and the test will be Thursday. Be sure to use the resources on the unit webpage to help you study. Your thermodynamics lab report is due on Friday and must be uploaded to TurnItIn.com by 3:00 on that day. By the end of the week we will turn our attention to electricity as we embark upon our electrostatics unit. We will finish our first unit on the celestial sphere this week as we explore how the appearance of the night sky changes throughout the year. We will conduct a culminating project in class and will take the unit test by Friday. Be sure to use the podcasts on the unit web page to guide your studying. The unit homework will be due the day of the test and is a great way to test your skills. Big news! You’ve developed your skills in the planetarium. Now it’s time to put them to the test in the real world as you do your first outdoor lab. This lab will require you to make multiple observations outside on a clear night over a couple of consecutive hours, so plan ahead to ensure you don’t get stuck with a cloudy night right before it’s due, which will be on Tuesday, March 11. I’ve shared this before, but with a new semester of astronomy underway, it’s a great time to remind you about some really fun, free software that turns your computer into a virtual planetarium. The software is called Stellarium. Check it out! It’s fun! Happy President’s Day! This week marks our halfway point for third quarter…wow! Be aware that we will not get as much done this week as usual because it is a four-day week, I have meetings all day on Tuesday, and on Thursday/Friday we will be discussing course recommendations for next year, which requires time for me to meet with each of you individually. Please look at the ALHS Program of Study 2014-2015. Science course descriptions begin on page 51. Please come to class on Thursday prepared with ideas and questions regarding your science options for next year. For Tuesday please do homework 3 and your thermodynamics processes graphic organizer. You will go over this and then will do an experiment on Tuesday into Wednesday. We will quiz over the First Law of Thermodynamics and PV diagrams on Thursday. Homework 4 will likely be due Thursday or Friday, and we will hopefully test this unit next Monday. Please look at the ALHS Program of Study 2014-2015. Science course descriptions begin on page 51. Please come to class on Thursday prepared with ideas and questions regarding your science options for next year. Your momentum unit test will be on Wednesday. For Thursday please take notes on Podcast 1 – Introduction to Circular Motion, Podcast 2 – Circular Motion Formulas, and Podcast 3 – Formulas for Thursday. For Friday please take notes on Podcast 4 – Centripetal Force if announced. On Wednesday we will continue to examine the northern sky and the circumpolar stars. We will quiz over this topic on Thursday or Friday, and Podcast 3 – Circumpolar Stars will help you study. At the end of the week we turn our attention from how the sky changes as you travel north/south and will instead start examining how they sky changes throughout the year. Anticipate a test over the celestial sphere unit some time next week. We will finish debriefing assignment one on Monday and will then take a quiz over temperature and heat on Tuesday, which ironically will be cold. We will explore the ideal gas law and the kinetic theory of an ideal gas on Monday, and homework 2 will be due on Tuesday followed by a quiz on Wednesday. We will spend the rest of the week on the First Law of Thermodynamics and will explore various processes using Pressure v. Volume graphs both conceptually and in lab. Animations and weblinks on our unit 9 webpage will help you through these concepts. As a reminder, your lab report on our Bernoulli’s equation lab is due at the start of class on Tuesday, and it must be uploaded to TurnItIn.com by 3:00 on that day. Third period class: On Monday your assignment 3 is due at the start of class, and we will take a quiz over elastic, inelastic, and totally inelastic collisions on Tuesday. Sixth period class: We will work on assignment 3 in class on Monday, so don’t do it for homework. Your quiz will be on Wednesday. For Tuesday (3rd period) or Wednesday (6th period) you should take notes on the remaining podcasts for this unit. We will explore these as we look at the impulse-momentum theorem in class and do assignment 4. We may test this unit by the end of the week. Remember that your lab report for the Conservation of Momentum Lab is due on Thursday at the start of class and should be uploaded to TurnItIn.com by 3:00 on Friday. On Monday we will examine the E-S-W sky and south declination stars as we use meridian diagrams to place the celestial equator at different latitudes. Then we will journey back into the planetarium to turn our attention to the northern sky. We will transpose the northern sky onto our meridian diagrams to create a full picture of the celestial sphere at different latitudes. Expect a quiz over this on Wednesday or Thursday. Podcast 2 – Celestial Equator and Celestial North Pole and Celestial Sphere Podcast 3 – Circumpolar Stars will help you study. By the end of the week we’ll look at annual changes in the appearance of our night sky. Talking cars? 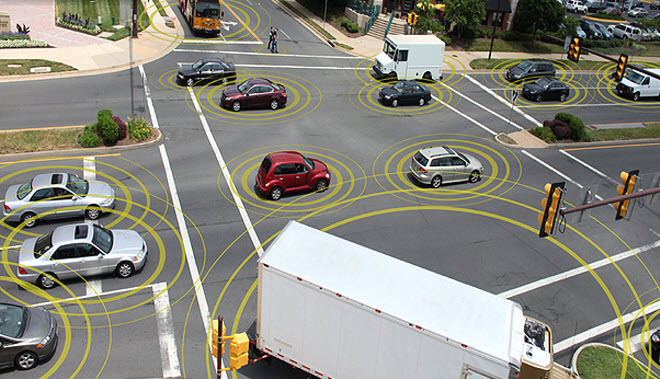 Redefining what it means to be a smart car, the US government announced this week approval of new technology that would enable cars to interact with each other wirelessly in order to alert drivers to hazards.